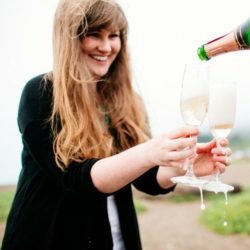 Welcome to Amber Pizante, a California Based Life & Style Blog where you will find my love for all things home decor, entertaining, styling, + so much more. For as long as I can remember, I have always had a creative side that seemed to be expressed in constantly rearranging furniture, redecorating my room, scrapbooking, or doing any type of DIY project. This blog started and still serves as my creative outlet, where I can showcase all the things that I love in one place. When I’m not blogging, you can find me at my day job. Which on a good day may consist of me running around trying to figure out how to close down a street in San Francisco to throw an epic street party. On a bad day, it’s a Fire Marshal saying, “no, you can’t do that.” And of course, executing pretty events in-between all these things. It forces me to constantly think outside the box and challenges me on a daily basis. I live in Oakland, California with my husband and sweet little French Bulldog, Lily. Oakland is such and interesting and vibrant city with a little something for everyone. There are some seriously amazing (and gorgeous) neighborhoods here. I’m obsessed with my own neighborhood right by the lake that is filled with coffee shops, charming wine bars, and amazing restaurants. It’s also bursting at the seams with old homes full of charm that I dream of owning one day. Fun fact…our apartment is right up the street from where we did our first look wedding day pictures (before we lived here). That life should be filled with things that you love. Whether that’s an experience, person, a jacket that makes you feel a little extra badass, or the perfect piece of furniture that completes your living room. Life is too short to surround yourself with anything but love. Life should not be lived without good guacamole and queso. Having too much champagne can just be so right sometimes. If it’s not moving then you should definitely monogram it, because is it even yours if it’s not monogrammed?! Just like champagne, having a little too much sparkle sometimes is just so right. Blue and white accessories go with any home decor style. A girl can never have too many candles and it’s completely normal to stock pile your favorite scents. A little extra hustle can go a long way and being kind never goes out of style. I can’t thank you enough for stopping by and following along with me through my adventures of life in decorating, cocktail making, and occasional DIYing!